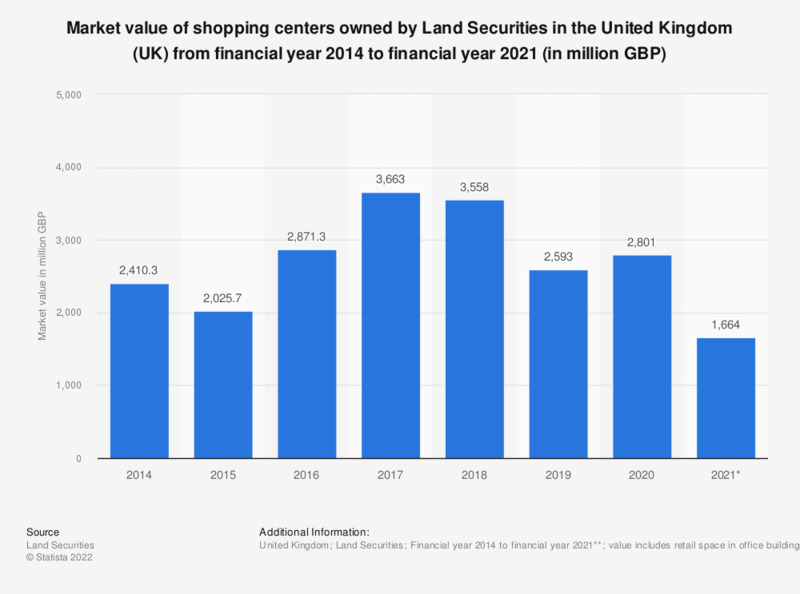 This statistic shows the market value of shopping centers and shops owned or part owned by the Land Securities Group in the United Kingdom (UK) from the financial years 2014 to 2018. As of 2018, Landsec owned or part-owned 16 shopping centers across the UK, with a market value of approximately 3.6 billion British pounds. St Davids Dewi Sant, Cardiff. West 12 Shopping Centre, W12. ** Financial years end on March 31st each year. Figures for years prior to 2018 were taken from previous annual reports by the source. Statistics on "Shopping centers in the United Kingdom (UK)"